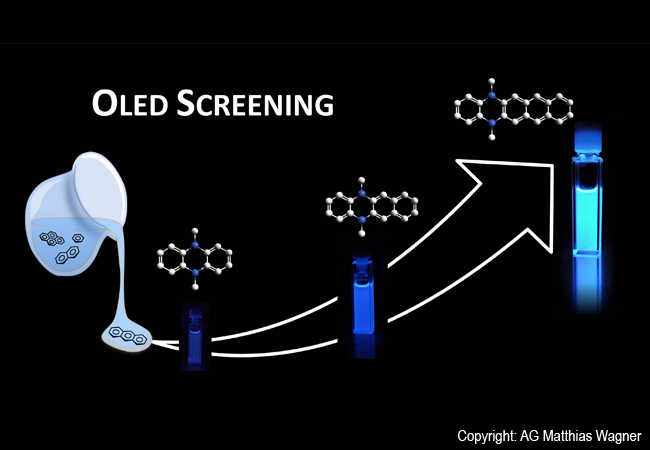 Organic light-emitting diodes (OLEDs) are promising candidates for flexible flat displays. By means of a screening process developed by chemists at Goethe University Frankfurt, it is now possible to identify more quickly lead structures with superior luminescence and charge-transport properties. The rising demand for increasingly sophisticated smartphones, tablets and home cinemas is a growing challenge for display technology. At present, organic materials are the most effective way to master this challenge. In particular molecules from the class of materials known as polycyclic aromatic hydrocarbons (PAHs) can be used to produce large and mechanically flexible flat screens. They unite brilliant colours with high resolution and are at the same time low in energy consumption. Chemists at Goethe University Frankfurt are currently working on new types of organic luminescent materials which owe their particularly promising properties to the introduction of boron atoms into the PAH scaffold. To date, the syntheses required have been extremely complex and time-consuming. A recently developed screening process, which makes a wide variety of boron-doped PAHs quickly and easily accessible, could in future alleviate this situation. The technique makes it possible to evaluate their potential as OLED materials. Only the most promising candidates will be examined more extensively in the next stage. As the research group led by Professor Matthias Wagner at the Institute of Inorganic and Analytical Chemistry of Goethe University Frankfurt reports in the scientific journal “Angewandte Chemie”, the method is based on a three-component reaction: Two components remain unchanged in all reactions whilst the third is chosen from a broad range of cheaply available PAHs. The reactive boron-containing starting material plays an important role in the assembly of the molecular scaffold. In addition, it gives the compounds obtained the desired optoelectronic properties by increasing luminescence and improving the materials’ electrical conductivity. “For a long time, it has mostly been pharmaceutical research which has profited from screening processes”, says doctoral researcher Alexandra John. “Yet it makes sense precisely in the dynamic and growing field of organic materials to use similar strategies to achieve results in a cost-efficient and resource-friendly way”. Professor Matthias Wagner adds: “Our development’s market relevance can also be seen by the fact that the Federal Ministry for Economic Affairs and Energy is giving our research work generous financial support.” The funding instrument behind it – WIPANO – supports the transfer of knowledge and technology through patents and norms and aims to ensure the commercial exploitation of innovative ideas and inventions generated by public-funded research by safeguarding and utilizing intellectual property. Wagner and John have already filed a patent for their process. Publication: Alexandra John, Michael Bolte, Hans-Wolfram Lerner, and Matthias Wagner: A Vicinal Electrophilic Diborylation Reaction Furnishes Doubly Boron-Doped Polycyclic Aromatic Hydrocarbons, in: Angew. Chem. Int. Ed. 2017, DOI: 10.1002/anie.201701591. Caption: A new screening process means that promising OLED lighting materials can be identified more efficiently.